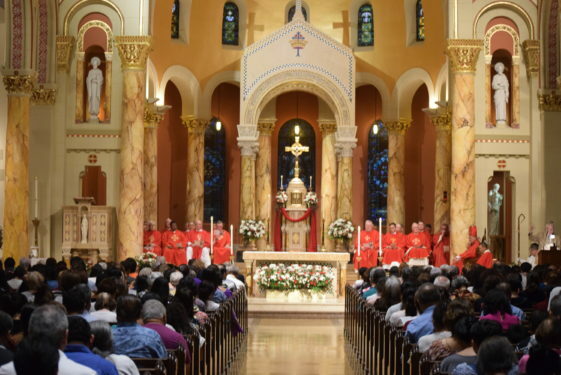 As St. Bartholomew Church celebrated its parish feast day, the Elmhurst parish was also proud of its new looks – showing off the completion of its $3 million renovation as Bishop Nicholas DiMarzio celebrated Mass and blessed the church Aug. 24. Renovations included a new roof, full interior paint job and air conditioning was installed in the church for the first time. The current church building was built in 1926. The renovations were much needed as the parish has seen tremendous growth in the last five years, according to Father Rick Beuther, pastor. 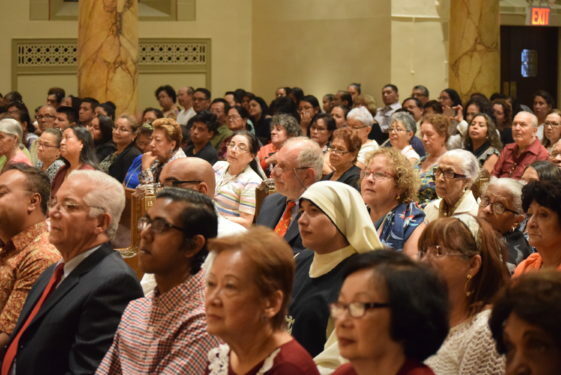 The average Sunday Mass attendance is now 4,500 with 11 Masses on the weekend celebrated in English, Spanish, Tagalog, Indonesian and Bengali. Funding for the recent renovations was raised through Generations of Faith and from parishioners’ donations. 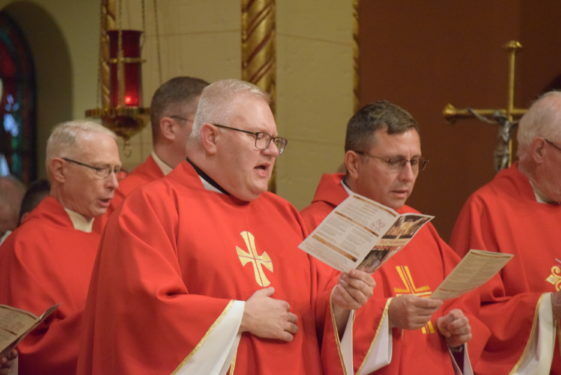 Bishop DiMarzio was happy to help the parish celebrate its feast and its new appearance. “The parish is very proud to show off the completed work and show off their church,” he said. “This is a very diverse parish that has many different people and they can all come together here. As the neighborhood has grown and changed so has the church. So many different nationalities are represented here and are able to put their faith on display. “Everyone is very excited to be able to see all the work completed but we are also here celebrating the feast day of St. Bartholomew and what he stood for. He was skinned alive and suffered greatly. He died as a martyr for spreading his faith,” he said. In the front of the church, the bishop noted, is a statue of the parish patron showing how he painfully he suffered. “I feel so blessed that we are able to celebrate this day,” said Father Beuther. “We are all very excited to be able to have the renovations completed and to have our church looking as beautiful as ever. Completing a $3.3 million renovation is no easy task and to have it completed for our feast day means so much to so many people. “We are all here today to celebrate together. I am so happy to celebrate this day and it is great to see so many people come out and show their support,” he said. “This is the first time we have had air conditioning in the church so I think that is going to be great for everyone. My favorite part, though, was the paint job as the church looks so beautiful. Especially our pillars that were hand painted,” the pastor added. Parishioner Louise Lineat knows her church represents so many people and was proud that they were all there together. “We are a parish of so many cultures and to be able to have a day and celebration where we can all come together is so special. We are all here today to represent our church and show support for one another. We are here as one parish,” Lineat said. I have the opportunity to serve this great Church, St. Bartholomew since November 2017. I have witnessed how beautiful is the team work in this parish. Fr. Rick, the pastor has great organizing capacity and pastoral skills in Organizational leadership. He involves all people to come forward to participate in all the activities of the parish. 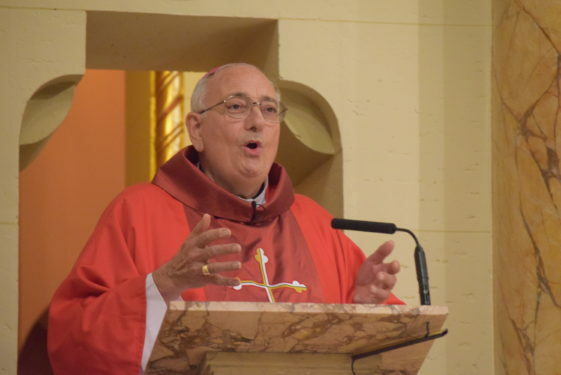 His vision of the parish is “A Communion of cultures – A communion of Saints’. ‘Una Communion De Culturas – Una Communion De Santos’. The renovated church is his contribution to make Church more beautiful and for God’s greater glory. This is the sign of promoting holiness of life, sharing the gospel to the multicultural communities and promoting Catholic values among all and in lifestyle. May his pastoral zeal to serve the people of all cultures bring joy, love and peace among all who come to receive God’s blessings.